Anybody can put a spinnaker up but the problem is to get it back on the boat. That's when the spinnaker sleeve makes a very powerful and expensive sail disappear with a minimum of fuss and drama ready to be hoisted again immediately with no packing! 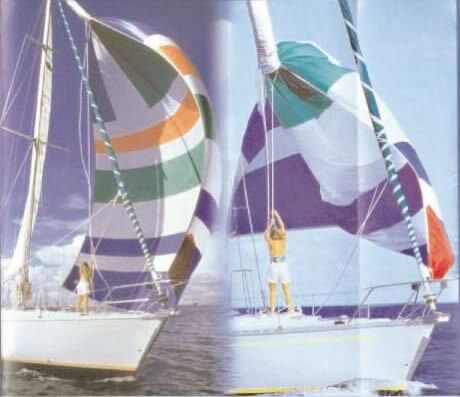 A spinnaker sleeve is a simple sailing tool but it has to work easily and be reliable. The sleeve body is made from 'tricot' mesh which is strong, light and doesn't retain water. The sail can dry when in the sleeve and it will not cling to the sail when hoisting, even after long period of wet storing. A separate dousing line channel is sewn outside the main sleeve body so the spinnaker and the control line are completely separated to avoid chafe and tangling. The side sleeve is made of a contrasting colored cloth which warns of potential twists when hoisting it. The bottom flange is made from a composite Kevlar/glass material which offers a good combination of strength, rigidity and lightness. This oval shaped funnel slides down easily over the sail without chafing it and it is light to minimize weight aloft. The control line is a closed loop, made of 2 different lines. One part is inside the sleeve, small enough to travel through it and over the top turning block. The other side is a heavier soft braided line which is comfortably handled by the operator to douse the sail. Finally, the spinnaker is attached inside the spinnaker sleeve with a swivel shackle to pivot which allows jibing. 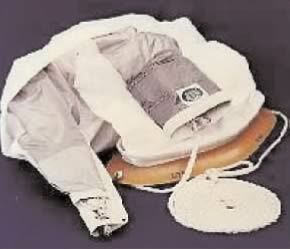 • Good for any spinnaker, reacher, gennaker, MPS, screecher or mizzen staysail up to 15,000 sq. ft.